Niagara Falls Canada is a magical place. Growing up as a dark ride enthusiast, there was nothing more exciting (and terrifying) than a trip to Niagara. While other destinations like Ocean City (New Jersey and Maryland) or Kennywood (Pennsylvania) offered some thrilling dark rides and fun houses, Niagara was sensory overload. At any given time in my life there were no less than nine attractions there, ranging the gauntlet from a harmless fun house to a blood-curdling haunted attraction. These fascinated me as a child and helped shape my love of the industry today. With a very deep history, Niagara is a great example of where the industry was, and where it is going today. Over the years there have been three dark rides, five funhouses, and ten walk-through attractions. This is also not counting wax museums or 4D theaters. In the interest of continuity, the attractions to follow will be explored in chronological order. So, join me today as we look at the single-rail dark ride attractions of the past and present at the haunted landscape of Niagara Falls. 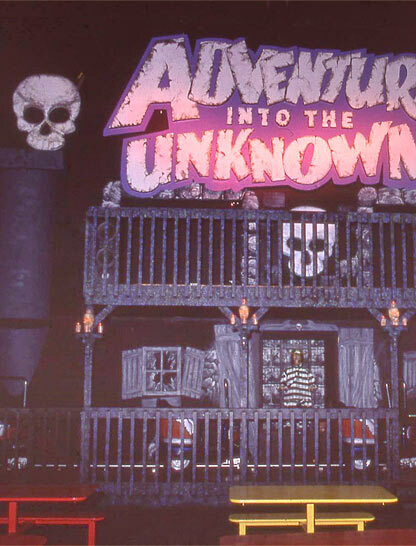 The year 1975 saw the opening of Niagara’s first single-rail dark ride, Adventure Into The Unknown. One of the most famous landmarks in Niagara is Skylon Tower. Built in 1964 and standing at 520 feet tall, this tower is famous for its view of the Falls and revolving dining room. Here’s where things get crazy. It also included a small indoor amusement park in the basement. It contained some minor rides like a Herschell merry-go-round, bumper cars, and even an Eli Bridge Ferris Wheel, known as Big Blue. Sometime in early 1975, the Adventure into the Unknown dark ride was added. This ride would come to be as mysterious as its namesake. Very little information exists on it today and what we do know is even more confusing. The outside was adorned with skulls, had a centerpiece of a patient in an electric chair, and featured a giant pterodactyl on the left. To add more to the mystery, the inside was themed as a western ghost town. It also contained falling barrels and other classic stunts. The cars appeared to be Bertazzon cars, with the buccaneer theme, similar to Gillian’s Haunted House in Ocean City, NJ, but with a lap bar. It is unknown if this was a two-story ride or if the balcony doors were just for props. Starting in 1995 the small amusement park began to close with Adventure into the Unknown shutting its doors in 1999. 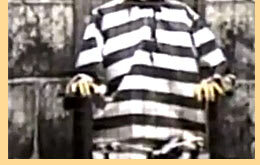 However, many of the props such as the skulls and pterodactyl remained in the basement for many years to follow. They eventually vanished as well. The basement of Skylon tower is now an arcade still featuring many classic games from the 70s.